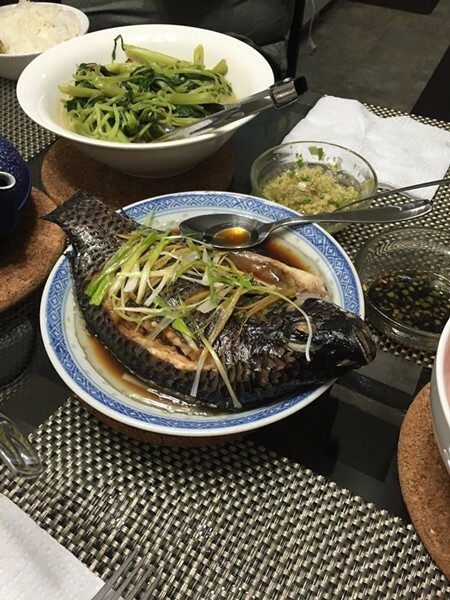 The fish was "ok" (photo courtesy of Yelp user "Sung L."). Oh, and there’s also this: Chiu’s doesn’t exist. But I didn’t figure that out until after I had driven 45 minutes along winding backroads, fueled by a small number of enthusiastic online reviews and the prospect of a big scoop, to arrive at a cute little house that most certainly didn’t look like a restaurant. Still, I didn’t give up hope — not even after the middle-aged white lady who answered the door (and who, I’ll admit, didn’t exactly fit the picture of the “Chiu” I’d conjured up in my mind) politely explained that she’d been living in the house for nineteen years, and, as far as she was aware, there had never been a restaurant there. Helpfully, she suggested that I check out Uncle Wong’s around the corner. I held onto that shred of hope even after circling the area several times to determine whether a slightly inaccurate street address might have been the culprit. And even days later, after I verified that the Contra Costa County health department had never inspected or issued a permit for any legitimate restaurant with the name “Chiu’s Moderately Ok Chinese” (or anything remotely similar) in El Cerrito or any of the surrounding cities, I wondered if the place might be some kind of top-secret, unlicensed supper club. Did the woman who answered the door turn me away because I didn’t know the password, or because she pegged me for a health inspector or, worse yet, a journalist? In the end, after reaching out to the four Yelpers who wrote the reviews that first sent me on this misadventure, I figured out that the correct explanation was the simplest one: I’d been duped. And it’s embarrassing how easy it was to fool me. The first step, if your goal is to prank a food critic, is to come up with a good name for your fake restaurant. 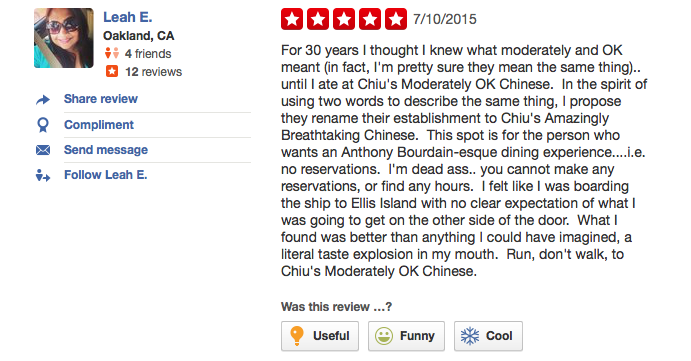 Goofy and self-deprecating, “Chiu’s Moderately Ok Chinese” is a great restaurant name; possible headlines for my intended review practically wrote themselves. Once I realized the whole thing was a joke, I wondered what the punchline was. If it was a prank, who was it a prank on? The typical foodie who’d be dumb enough (like me) to drive into the middle of a remote residential neighborhood just for the bragging rights of being one of the first to have some uniquely authentic food experience? It might be awfully self-absorbed of me to imagine so, but it occurred to me that the entire stunt might be an elaborate trap to ensnare me personally. Anyone who has read my columns for any length of time probably knows that if a sandwich shop opens in the back of a convenience store or a barbecue pitmaster sets up outside of a gas station, it’s practically a guarantee that I’ll find some way to write about it. An internet troll wouldn’t have to think too far out of the box to realize that a secret homestyle Chinese restaurant is right in my wheelhouse. The truth turned out to be somewhat more mundane. A group of friends decided to write “reviews” of a dinner party hosted by their friend Chiu, reportedly an excellent Chinese cook. Chiu’s friends had long told him that he should open his own restaurant. “Maybe your misadventure will finally motivate him to try,” “James T.” wrote. I hope it does. At the risk of playing to type, I have to admit: If Chiu ever really does open his “moderately ok,” top-secret underground Chinese restaurant, I’ll be one of the first in line. Update 9/1: A brief epilogue.